Every year for my mom’s birthday, my brother and I try to do something special for her. In recent years, we’ve taken her to dinner and to the theater. She never gets to go otherwise, so it’s a pretty perfect gift for her. This year, we got tickets to see My Fair Lady at the Arena Stage. The show was fabulous. It’s always so cool to see a performance in that format, and they did an excellent job. Dinner and the theater can be pretty pricey, but I co-opted my brother into helping me discount our evening. He got the tickets on Goldstar. If you haven’t heard of it, it’s a great service that allows you to get discounts on area shows and events. 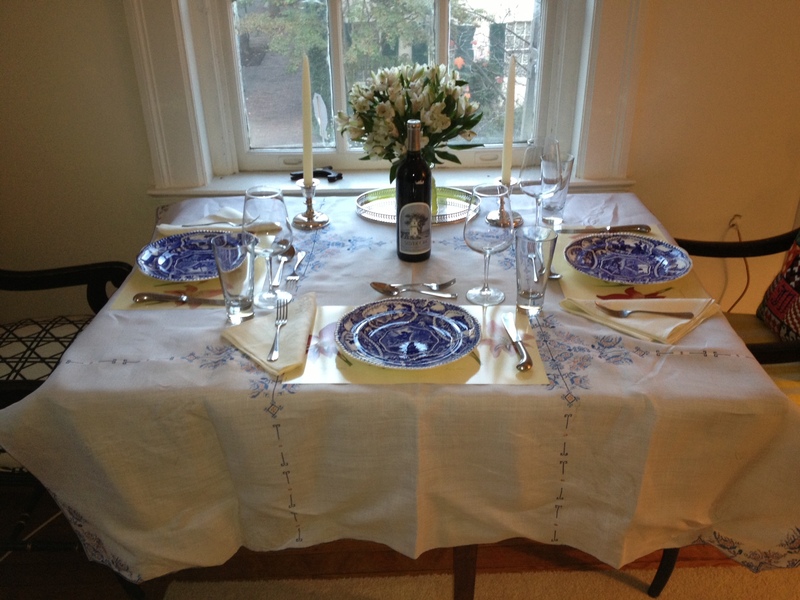 Instead of going out to a pricey restaurant, I hosted dinner for us at my house. My mom loves a pretty table, so I took extra time to make a lovely setting for her. I polished the silver (not my strong suit! ), got out the nice linens, and bought flowers for a centerpiece. Main Course: Jeffrey’s Roast Chicken from the Barefoot Contessa – Highly recommend this. It’s easy, delicious, and inexpensive. Total bill to serve mom a special dinner at home: $64.86 (split with my brother, it became $32.43 a piece). Compared with a $100+ bill from a nice restaurant, I think that’s not too shabby! Plus, I think my mom enjoyed eating at home more. She gets a kick out of seeing us entertain. And because of her, we were able to learn from a master! An absolutely wonderful birthday celebration! Anyone would enjoy themselves to the max with such good company, good food and wine and great show.